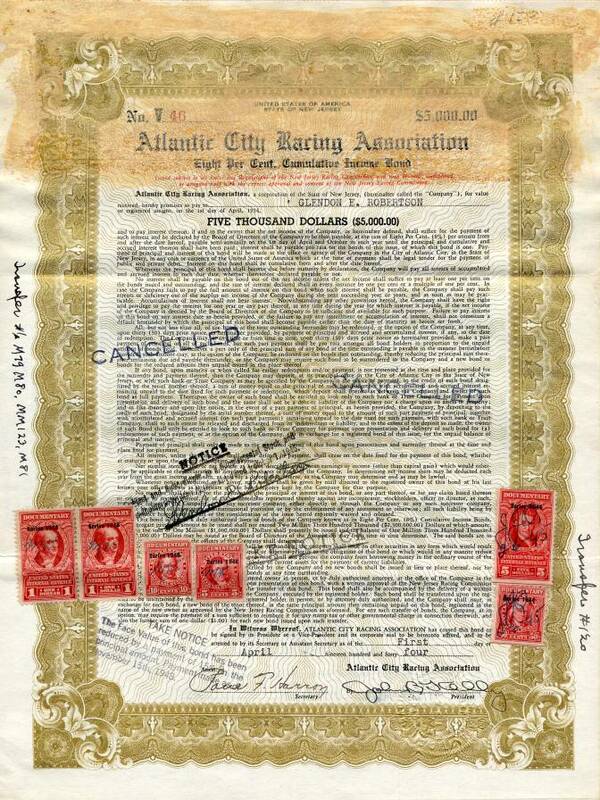 Beautiful $5000 Bond certificate from the Atlantic City Racing Association issued in 1944. This historic document was printed by the Goes Company and has an ornate border around it with a vignette of the title of the association. This item has the original signatures of the Company’s President, John B. Kelly and Secretary, and is over 68 years old. Light stained on top of bond. Atlantic City Race Course opened its doors on July 22, 1946. The introduction of the nation's newest race course was thanks to the great might and sure labor of four dedicated individuals. The most famous of the group was John B. Kelly, father of the late Princess Grace of Monaco. 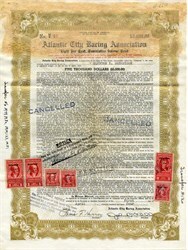 Prominent Philadelphia contractor and U.S. Olympian, Kelly was the first President of Atlantic City Racing Association. Brick by brick, Kelly toiled for more than 10 years to bring his dream to life. Completing the illustrious group of business-and-sportsmen were Fred C. Scholler of Scholler Brothers (chemical manufacturer), Glendon Robertson (Roxborough Hosiery Mills in Philadelphia), and James "Sonny" Fraser, astute executive and champion golfer. After resurrecting a Northfield golf course and renaming it Atlantic City Country Club, the savvy group set their sights on a racetrack. The founding four quickly romanced any opponents by backing the project with a virtual who's who of Hollywood. Original stockholders included Bob Hope, Frank Sinatra and six of the nation's big band leaders -- Kay Kyser, Phil Spitalny, Harry James, Xaviar Cuget, Sammy Kaye and Axel Stordahl. The venture totaled $3.5 million in the end ($1 million over original projections), but was worth every shiny penny. When the doors first opened on July 22, 1946, a roaring crowd of over 28,000 heralded the state-of-the-art race course. They applauded now Hall of Fame Trainer Warren "Jimmy" Croll for bringing the first horse onto track grounds and for capturing the 4th race of the inaugural card. They witnessed leading jockeys like Eddie Arcaro, Johnny Longden and Ted Atkinson during the historic opening season. And thanks to huge staffing that numbered 2500, fans were also well pampered. A typical day at the track could include a trim at the in?house barbershop, cocktails with a brimmed companion and even a lucky tip from your favorite guard, usher or waiter. There was no doubting its phenomenal success as the track became Atlantic County's crowned jewel. Succeeding the late John B. Kelly in 1960, was radio and television pioneer, Dr. Leon Levy, thus beginning a romance with one of racing's most prominent and loyal families. Dr. Levy was acknowledged as a huge advocate of turf racing, and his efforts propelled Atlantic City's grass events into a class of their own. When Leon Levy stepped down as Atlantic City's second president, the baton was passed to the equally-talented hand of his son, Robert P. Levy. It was through the creative ingenuity of Bob Levy that the Matchmaker Stakes was born. The "race for love and money", as the Matchmaker is known, annually awards valuable stallion seasons in addition to a lucrative purse to its top three finishers. Almost 30 years later, the famed Matchmaker is still one of racing's most unique events. John B. Kelly has made several names for himself—in business, sports and politics. As a young boy, he went to work carrying hods for his brother, a brick contractor. In his spare time he practiced rowing on the Schuylkill, became proficient enough to try for the Diamond Challenge Sculls at Britain's Henley Royal Regatta in 1920. He was turned down, though; as a former bricklayer, he was not considered a gentleman. Kelly beat the Diamond Sculls winner just the same, at the Olympics two months later, and sent his stained sculling cap to King George V as a booby prize. In 1947 and 1949 son Kell won the Diamond Sculls easily, topped off his father's revenge. John B. Kelly built up a prosperous brick contracting business and began to dabble in politics. When Philadelphia's Democratic Party was reviving in 1935, Kelly ran for mayor, lost by 47,000 votes.